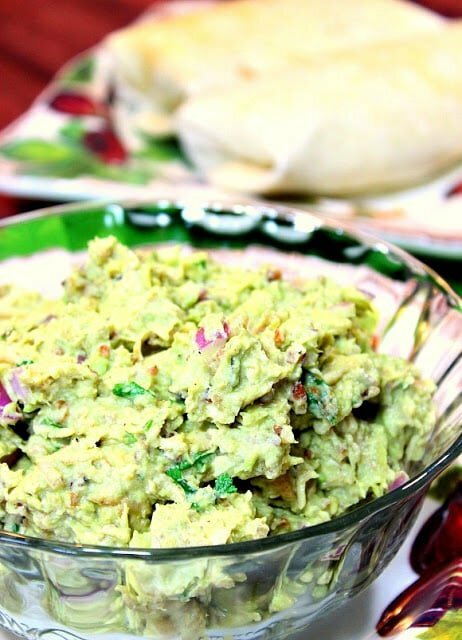 Fast Easy Avocado Chicken Salad is a wonderful and easy filling for tortilla wraps. Store-bought rotisserie chicken makes it the perfect choice for a quick and tasty grab-and-go lunch or dinner. This may not be the prettiest chicken salad in the world, but if you’re an avocado lover, the beauty lies within. The first day I made this Fast Easy Avocado Chicken Salad, I mixed the mashed avocado with Greek yogurt for that little bit of tang that Greek yogurt provides. The next time I make it however, I think I’m going to mix it up with a little bit of mayonnaise (because I’m recently following a high-fat, low-carb diet), along with a touch of lemon juice. Greek yogurt or mayonnaise, either way you make it, it’s still a “winner, winner avocado chicken salad dinner!” I know you’ll agree. Another thing I know you’ll appreciate about this recipe is that it’s a no-cook meal. No need to turn on the oven in the scorching summer heat. Plus, the cool and creamy avocado is just what the doctor ordered after a long, hot day. 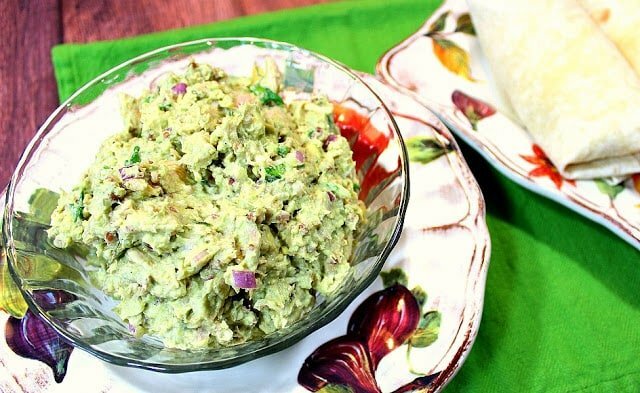 -Mash the avocados in a medium sized bowl. Stir in the yogurt, cilantro, chicken, salt, pepper, red onion, olive oil, cumin and coriander. -Fill tortillas with cheese, top with some avocado chicken salad, and lettuce (if desired). Roll, wrap in plastic wrap or aluminum foil, and refrigerate until ready to serve. My husband and I took these Avocado Chicken Salad wraps for dinner one night when we went shore fishing after work. We didn’t catch any fish, but dinner was delicious! 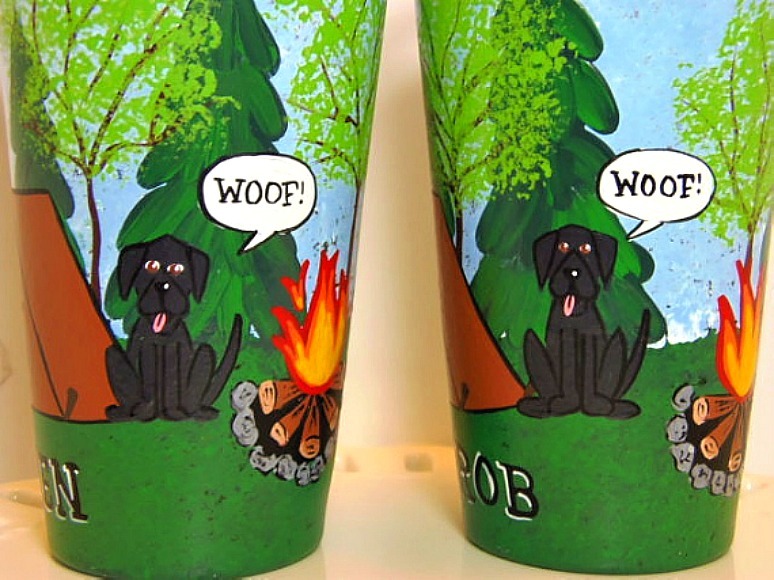 These everyday camping glasses seemed like a fun (and colorful) note to end on. They actually have nothing at all to do with the Avocado Chicken Salad recipe. It’s just the fun fact that my husband and I took the salad on our fishing trip. LOL! Yes, I’m really reaching, but they’re cute glasses just the same, don’t you think? From aprons, to tea towels, to glassware, if there is ever anything I can paint for you, please don’t hesitate to contact me or visit my shop on etsy. Custom orders (as shown above) are always welcome, and always encouraged. What can I paint for you? This is probably my favorite way to make chicken salad! I love that added avocado mixed in. I've never tried avocado in chicken salad. Must try asap! You are so talented with your painting and crafts! I am anything but! Love using avocado instead of mayo in chicken salad, so tasty! Anything avocado has my name written all over it. 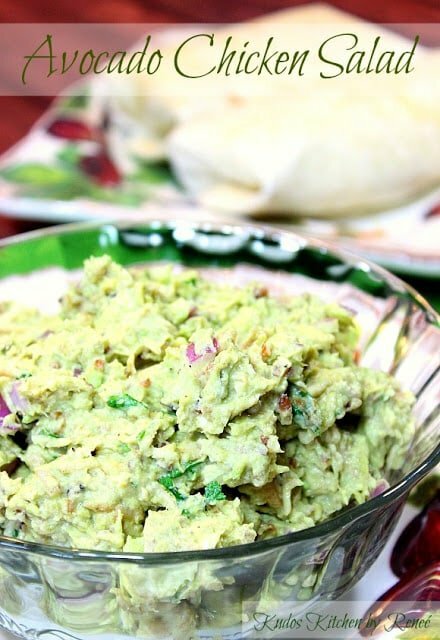 I love making avocado chicken salad! This is fabulous. Some foods just don't translate well in photos. But I know this would taste amazing. And honestly who cares what it looks like as long as it tastes good, right. This is stellar. And those glasses, too cute for words. Made this today….LOVED it! Thanks for another yummy recipe! That's wonderful, Lara. Thank you so much for letting me know!! So happy you enjoyed it! No cook meals are exactly what I'm looking for right now! I'm always up for chicken salad too! I love adding avocado to my chicken salad. It makes it extra creamy and I love the flavor…yum! Yes! I LOVE avocados in my chicken salad! Never had it as a wrap before…great idea!